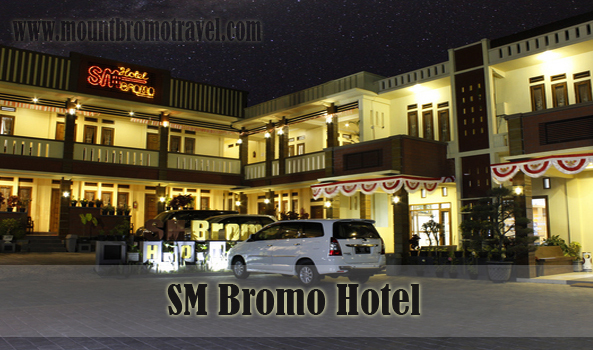 SM Bromo Hotel is the hotel recommendation for tourists who traveled to Bromo. Many people know that Mount Bromo is the tourist icon in East Java. This place is popular because of the sunrise. The sunrise in Bromo is famous all around the world. As a tourist area the travel Bromo destination that located in the Bromo Tengger Semeru National Park is located in the four territorial namely District Probolinggo, Malang, Pasuruan, and Lumajang. The location of SM Bromo Hotel is close to the Mount Bromo. This hotel is a 2 stars hotel. The location is in Krajan, Ngadas Village, Sukapura, Probolinggo, East Java. This hotel is approximately has distance about 2 km from the crater of Mount Bromo. The windy tropical mountain climate is around 14 up to 18°C during the day and 6 up to 10°C at night. The view around Bromo provides the wonderful view of the cliffs and the fresh mountain breeze and airy from the mountain. The high peak of Mount Bromo creates a magnificent sight in midnight to enjoy the sunrise that is spectacular and the amazing sunset. It is a big dream to have a peace and great weekend or fun holiday in Bromo even with spouse, family, friends, company gathering, and many events. The large room can be filled with four people per room with 2 beds. This hotel is also equipped with a television set and bathroom with hot water to make the tourists more comfortable to stay in Bromo. More than that, it is also completed with the dining table, living room and other services. The other facilities in the hotel are included the room, the meeting room. This hotel is also completed with the stage open, the mountain bike, and the large parking area. It is available the rooms for drivers either. The restaurant and the large lobby are also available in this place. The facilities will add more comfort zone in relaxing to this hotel. The most popular facility that this hotel offered is the Volcano Tour. This hotel offers the tour to the volcano of Mount Bromo. This service is actually the service of transportation to enjoy the sunrise. This service is managed by the organization of local transportation in Bromo that usually called Association of Jeep Bromo. This hotel actually doesn’t take the responsibility to the available of the jeep and the time in picking up. But SM Bromo Hotel can help to make the reservation of the jeep car.